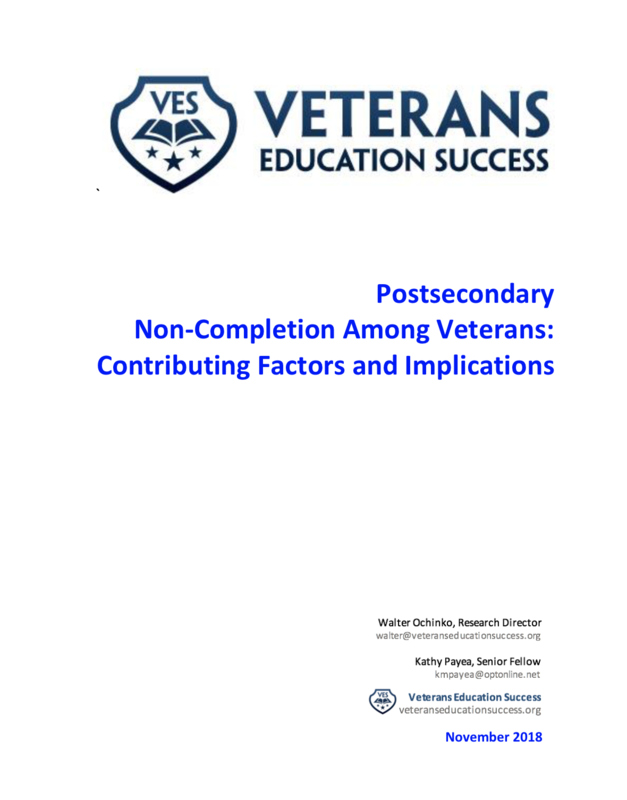 This paper uses Beginning Postsecondary Students (BPS), a longitudinal survey conducted by the Department of Education’s National Center for Education Statistics (NCES) to examine factors contributing to and the impact of non-completion for “first-time” student veterans pursuing a postsecondary education—certificates, associate’s, or bachelor’s degrees. BPS includes student veterans who were first surveyed during the 2011-12 academic year and again in 2013-14. Because students surveyed by BPS for a second time in 2014 had only 3-years to earn a degree, we used the Department’s National Postsecondary Student Aid Study (NPSAS:16) to analyze time-to-degree from students’ first enrollment date, obtaining a longer-term perspective. For comparison, we include data on non-veteran independent students, a group comparable to veterans that we refer to as “nonveterans.” In general, both veterans and such non-veterans are financially independent, older, and are often married with dependent children. Because the focus is on veterans, we highlight the differences between veterans and non-veterans only when we believe they merit attention.